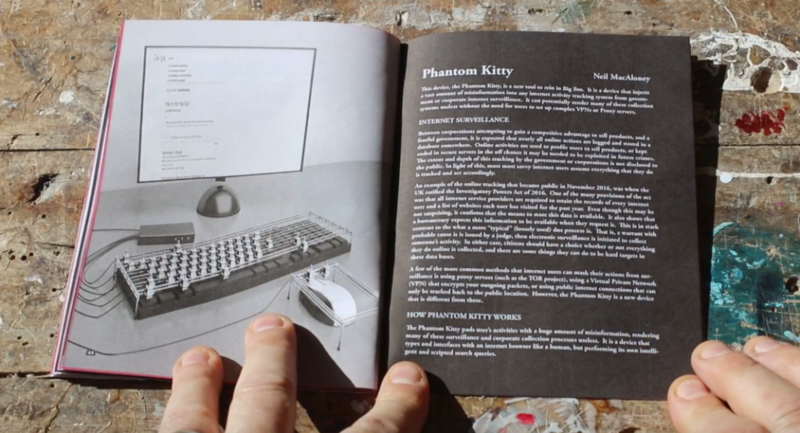 Disobedient Electronics: Protest is a limited edition publishing project that highlights confrontational work from industrial designers, electronic artists, hackers and makers from 10 countries that disobey conventions. Topics include the wage gap between women and men, the objectification of women’s bodies, gender stereotypes, wearable electronics as a form of protest, robotic forms of protest, counter-government-surveillance and privacy tools, and devices designed to improve an understanding of climate change. I was one of the lucky few to receive a hard copy of this fine little zine, a handmade limited edition of 300, put together by Canadian artist & researcher Garnet Hertz. It features 24 contributions of critical art & design, many of which taking a strong stand on feminism and surveillance /privacy issues, indispensable in current debate. Hertz initiated this publication in response to post-truth politics, in itself a notion shrugged off by populist drivel – “Politicians have always lied.” – Ptp- strategies involve the removal of scientific context from popular claims in order to comfort the masses in turbulent times of change. Such trends are noticeable in culture and thus in the DIY- movement too. After a disappointing visit at a maker’s fair, which essentially promoted the aesthetic design of blinking LEDs and the 3D-printing of decorative junk in an overall atmosphere of relentless marketing, the manifesto of Disobedient Electronics caught my attention, reflecting my impressions accordingly. Decline of culture becomes visible as ‘popular’ themes such as sustainability or integration policies are readily adopted but actually serve as mere buzzwords to increase the marketability of events and products. Since it became profitable to sell electronic boards and a variety of accessory components, the prosumer (Ratto, 2012) is bound to available materials and building instructions and not encouraged to experiment or imagine alternatives to already available commercial design. Therefore many important layers of technology get ignored or regarded as not worth exploring due to the fetishisation of the final result. Although focus should be on action oriented making, tactile objects /installations are important when linguistics fail. We have already incorporated digital structures in every social aspect of our lives and it is difficult to observe let alone express them. The book treasures the craft of DIY technology development, notably in the surveillance /privacy sector, and highlights the pressing need for knowledge in light of the technological advantage of those in power. Backlash provides us with an educational protest kit, including devices for off grid communication and bugging defence. These are functional but not necessarily designed for situations of conflict, rather for inciting a relevant debate among the general public. Phantom Kitty (work in progress) defies spying by authorities without a warrant and the enforced quantification of humans based on evaluations of online activity. It produces arbitrary noise when the user goes offline to obfuscate browsing habits and it is possible to integrate machine learning algorithms at a later stage, which could mimic or create identity patterns. Phantom Kitty features a stunning mechanical rack for keyboard and mouse operation, fed by a program executing search queries and the access of webpages. The project draws on the eeriness of neither knowing to what extent gathered data is exploited, nor against which parameters and targets it is set. 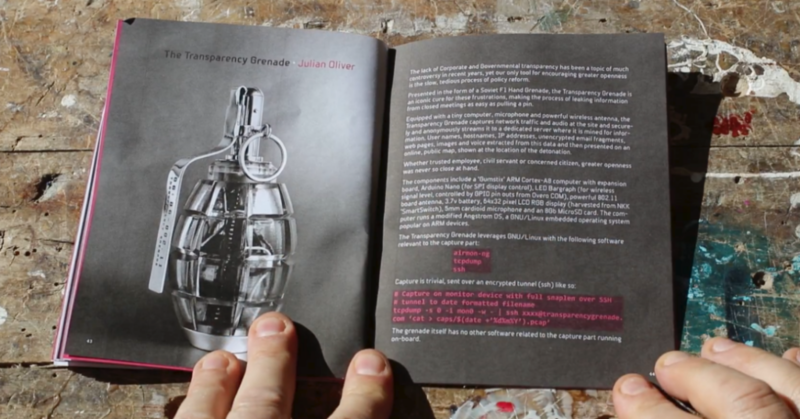 Completely left in the dark about the full scope of exercised control and entailing consequences The transparency grenade by Julian Oliver reminds us that citizens have a right to openness too. The promise of “making the process of leaking information from closed meetings as easy as pulling a pin” is tempting, and in contrast to the opaqueness of corporate and governmental policies, the artwork, other than claiming transparency, is representing it, in its aesthetics, open source software and in the thorough documentation of its engineering process. The well written accompanying text of one of my favourite projects PROBOTS describes effective works as “technologies of dissent that work at both the practical level but also the symbolic”, by all means valid for those involved making this book, albeit associating with a manifold of disciplines. The tele-operated protest robot certainly meet those demands and can be sent out by the precarious worker as an answer to the efficiency of contemporary policing, simultaneously a metaphor for the limited potential in the act of present-day corporeal protest. The silencing of political resistance happens far beyond the streets and PROBOTS makes an extraordinary research tool for investigating the organisational power of technology, which prevents social progress already from the outset. I’ve only recently discovered that e-textiles is not the same as smart clothing. It is a discipline, focusing on the act of making rather than the actual result, albeit in this case impressive too. 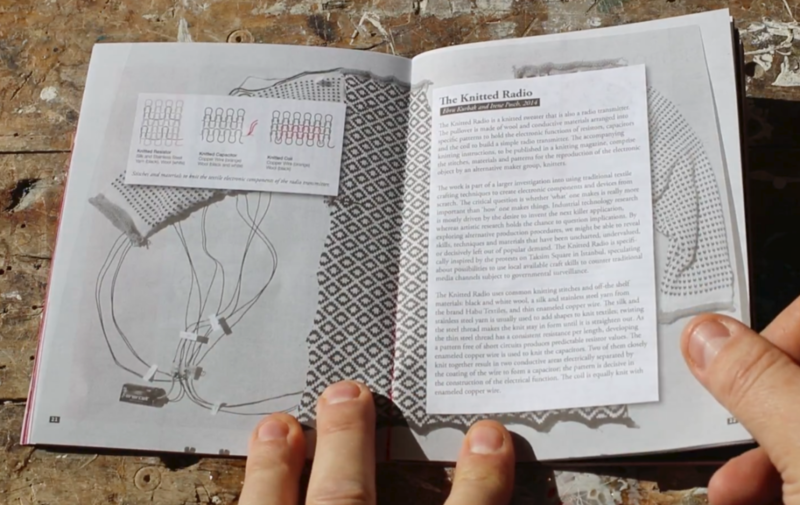 The makers of The Knitted Radio approached the craft of knitting and electronics without economic reasoning, a factor which primarily informs the engineering process in industrial design. The liberation from conventional standards brought about alternative forms and methods, that is a sweater that also functions as a FM radio transmitter and the skill to knit electronic components /devices such as resistors, capacitors and coil with conductive yarn, an off-the-shelf material. The knitting instructions for the sweater are available online, it can provide a free of cost, independent communications infrastructure. The concept was inspired by the protests on Taksim Square, Istanbul, Turkey, and associated violations of freedom of speech. 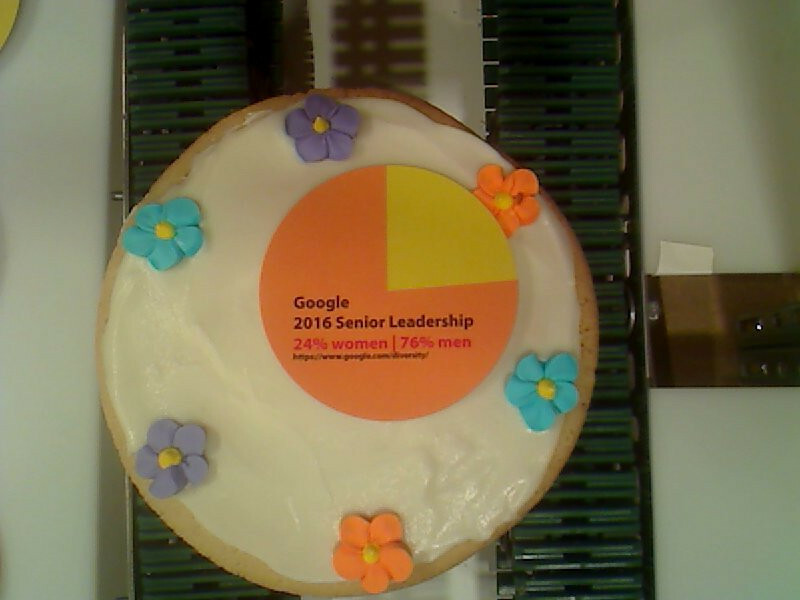 A Piece of the Pie Chart: Feminist Robotics by Annina Rüst illuminates gender inequity in form of a production line, which decorates edible pies with pie charts, depicting gender ratios in tech affiliated corporate or public organisations. Women are generally underrepresented in tech related workplaces and users of the gallery installation can browse and choose between various data sets on gender in technology, e.g. computer science graduation rates, before an ensemble of household applications and semi-pro robotics sorts the cake. The mere visualisation of data was not radical enough, so the finished pie can be shipped to the institution of which data (and gender inequity) originates, and where it can be consumed accordingly. Women have to be content with the smaller piece of the cake, also symbolic for economic inequality and the missed out experience of working in tech. Rüst was not satisfied with the claim that women are just not interested in tech, and further qualitative research in feminist technology showed that women are rather put off by its hostile macho culture and that technological pedagogy simply failed to inspire girls. 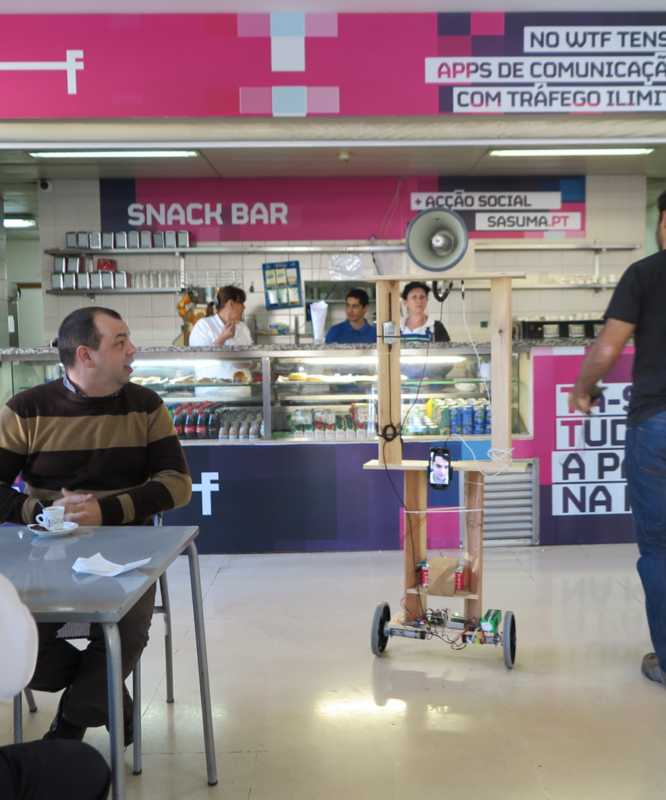 The PROTEST issue lives up to its title and emphasizes on projects, which propose hands-on political action and intervention with society, not in terms of providing solutions but to spark much needed discussion and inspire disruptive technology. 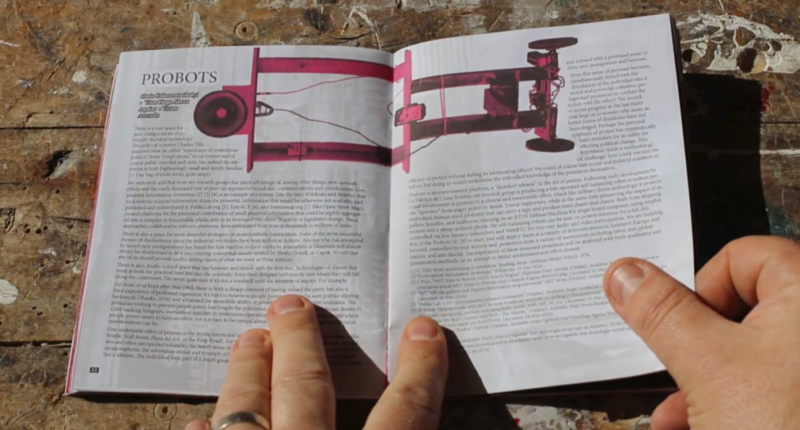 Disobedient Electronics follows the publishing project Critical Making, which comprised 11 issues, so there is hopefully some more to come. G.Hertz (Ed.) 2012. Conversations in Critical Making, Ctheory. Online version accessed 28/09/17. Verena Hermann is an artist and writer and member of the Open Systems Association (OSA), which stems from MA Digital Culture, Centre for Cultural Studies (Goldsmiths, UK). Current interest includes blockchain technology, both in terms of its practical implementation and investigation of its effects in a wider political context.